I can’t remember the last time I made a curry from scratch with fresh ingredients (Uncle Bens fault) so today I’ll do just that. I discovered an Indian deli tucked away on a side-street in the next town, so I’ll be venturing there later. Meanwhile, take a look at this Jamie Oliver recipe. I’m drooling!…. ~You will like this curry – it’s easy and fun to make. Two little tips are first, to use a Magimix or food processor to chop the onions and tomatoes as it makes less mess, it’s really quick and will stop you crying! 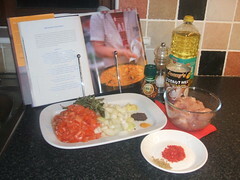 Second, get all your ingredients prepared and ready to go, then you can have the sauce finished in 15 minutes. Heat the oil in a pan, and when hot add the mustard seeds. 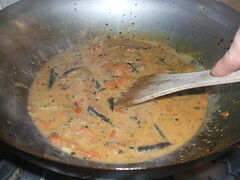 Wait for them to pop, then add the fenugreek seeds, fresh green chillies, curry leaves and ginger. Stir and fry for a few minutes. Using a Magimix food processor, chop the onions and add to the same pan. Continue to cook for 5 minutes until the onion is light brown and soft, then add the chilli powder and tumeric. Using the same food processor, pulse the tomatoes and add these to the pan. Cook for a couple of minutes, then add 1 or 2 wine glasses of water and the coconut milk. Simmer for about 5 minutes until it has the consistency of double cream, then season carefully with salt.Take this sauce as a base. 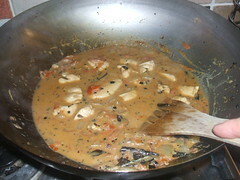 To make the fish curry, add the fish and tamarind to the sauce and simmer for 6 minutes. Feel free to add some baby spinach and chopped coriander at the end of the cooking time. ~I got all the ingredients Jamie asked for, or so I thought, prepared it (one hour, minimum) Meanwhile Hubs is starving looking in the fridge which REALLY annoys me! The kids are running riot , what’s new? Apart from No.1 who is ill on the couch with a bad dose of flu. No’s 3& 4 are dancing to the Scissor Sisters’ ‘Don’t feel like cooking dancing’ on the kitchen table as I de-seed and finely chop red chilli peppers. What can I do? Poke ’em in the eye? And No.2 is asking me intelligent questions while surfing the net. Stop!!!! I’m not clever! I burnt the curry leaves and Hubs said I didn’t. I DID! My husband enjoyed the meal and when I asked him what his real thoughts were, he said it could have been hotter. I used ground chilli flakes as opposed to chilli powder, DAMN! Makes all the difference to use the correct ingredients. Hang on a minute……. 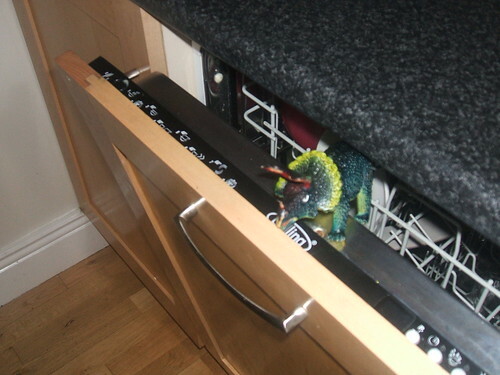 is that a dinosaur in the dishwasher? TIP: When de-seeding chilli’s wear surgeons gloves! I read this book last year and found it a very good read. Anthony Bourdain will eat anything! Imagine my delight when I turned on the T.V. last night, the book is being televised on UKTV Food! I know I’ve blogged on chefs before (if you pardon the expression) but I must do a ‘ickle blog on Rick Stein. I watched a double episode on his series last week and he is so good to watch! His passion for seafood is almost aggressive, although he does cook meat, too. In Octobers issue of BBC Good Food, the best foodie-mag on the shelf, he cooks ‘Braised Pheasant with Laphroaig & woodland mushrooms’. He serves this with parsnip mash and steamed savoy cabbage (my favourite veggies) I’d cook this by leaving out the booze and serving buttered peas. I always do a Sunday roast even if HWSBO is working, because he doesn’t usually get home until around 7pm at the weekends, by which time dinner is over, dishes are in the dishwasher and the children are in the bath. ..this isnt a ‘ickle blog, is it? But yesterday was different, I planned dinner later, he said he’d be home by 6pm and we would all sit down together for Sunday Dinner. HOORAY!!! I rang him at 6.40pm and he had been called to another job at Carton House, Maynooth and wouldn’t be home till 9pm. Why do men do this? He has a phone…. I’ve stopped to cool down and read a supplement from the said magazine. ‘The Cotswold Company’. Some lovely things in there. I’d love a Salon Stand. My hairdrier lives on the floor under my bedside table! So, back to the Galloping Gourmet….he only had to bung his dinner into the microwave when he came home (9.10pm) but what did he do? He flaked out on the sofa and spent the rest of the evening being waited on by lil’ ole’ me. 1. To keep a loaf crusty, store in a paper rather than plastic bag. 2. If your other half says he’ll be home at a certain time, add another three hours on. I always try to give the children something a little more interesting for breakfast than a bowl of cereal! They love homemade pancakes (weekends only!) crumpets and cooked breakfasts. Hubs only ever has breakfast on the very rare occasion or when we are on holiday. We visited relatives in New York in 1992 and were very impressed with the selection of breakfast items available in cafes. We had waffles with maple syrup and a neverending cup of coffee most mornings while we were there. I can’t remember the names of any of the places we dined in, so decided to look on the Internet where I came across this video. We are in the catering business (I still manage functions as and when I’m needed) and I just love to watch a chef at work. The wine, diet coke and Ballygowan flowed.The Ambassadors daughter sang, speeches were made and then they all got back on the bus and off to see ‘Riverdance’ at the Gaeity! This is going to be a long one! I have my gripes with most of these people. So bear with me especially if I come out with some expletives! First off, AWT. Yuk!!!! I saw him lick his fingers then carry on cooking. He farms pigs, so no wonder he behaves like one, too! I remember Delia saying something similar about him. So two culinary goddesses cant be wrong. Knows everything but Delia, don’t come into my house telling me how to boil an egg! So-so. The camera movement makes me feel sick, though. Gordon Ramsey has his head up his own a**. How anyone can talk to people the way he does and expect to gain respect from them at the same time is beyond me. He is a genius other than that! She should tie her hair back and wax her face. Her eyebrows are so thick, I’m beginning to think her Dad was Denis Healey not Nigel Lawson as we are all led to believe! I could watch Rick Stein cook all day. I would rather eat meat than fish, but his recipes are gorgeous. He is probably the most passionate of these chefs so far.